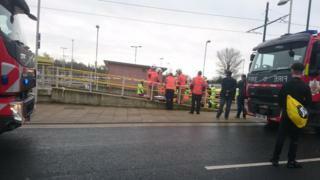 Metrolink services between Manchester city centre, Oldham and Rochdale were suspended after a woman was hit by a tram. Emergency services were called to a collision between a pedestrian and a tram at Oldham Mumps about 08:10 GMT. The woman's injuries are not believed to be life threatening, Greater Manchester Police said. Transport bosses said a full service had resumed between East Didsbury and Rochdale but warned of minor delays.